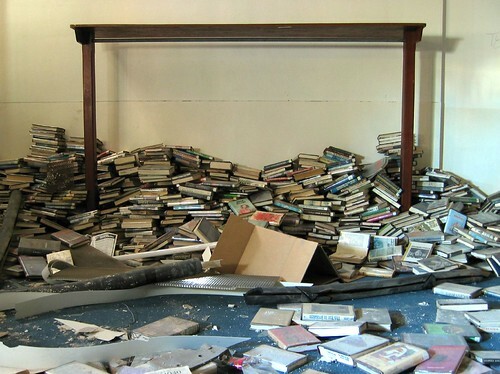 Are you an inveterate hoarder of books? Does nothing get your pulse-pounding like a good hour spent trundling around Waterstone’s, a gigantic pile of future reading material clasped in your arms? Have you spent the last five years wondering what on Earth you’re going to do with the steadily growing pile of ‘classics’ you just can’t bring yourself to throw away? Well, you’ve come to right place. So you have too many books to ever hope to fit them on one bookshelf. What do you do? Simple: turn all your furniture into additional, mini bookshelves! It sounds crazy: like the sort of tip you might expect from that ‘kooky’ aunt you have, but trust me on this. Several design companies are now starting to pump out ranges of chairs, coffee tables and sofas that are explicitly built to house books. With grooves cut in to keep the spines on display, these nifty little pieces of consumer-art are both functional and a pleasure to look at – as well as a guaranteed talking point. The problem of storage is mostly an aesthetic one: if we really didn’t care how things looked, we’d just cram everything into those garish plastic boxes, stick them under the table and be done with it. But we want our books to be both easily accessible and gorgeous to look at too. Here’s where the recycling concept comes in: if you have anything unusual or vintage kicking around your loft, consider turning it into a DIY bookshelf. Battered old suitcases – with a well-travelled look – are ideal for this; simply prop the lid open and fill with books, spine-up. Go as far with this one as your imagination will let you: over the years I’ve encountered everything from repurposed grandfather clocks to hollowed-out old Mac monitors. The more unusual your design, the better! Despite what you may feel as you look around, every home has free space – just waiting to become a quirky bookshelf. Don’t believe me? What about under your stairs? 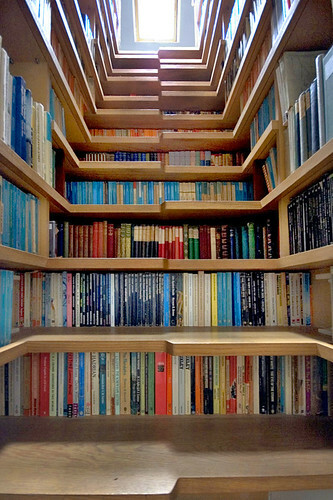 Only, instead of shoving your books away beneath them in boxes, knock the front-panels out of each stair and stuff it full of books, so their spines are visible as you walk up. Old fireplaces are ideal for this too: a little bit of work will create a nice hollow cavity that can be repainted and filled with books – creating an intellectual focal point for your living room. The space around windows, even the space between two timber beams (if you’re lucky enough to have any) can be converted into miniature storage spaces. So what are you waiting for? Get searching! It can be simple, effective and – done well – stylish to boot. The problem with stacking randomly is it looks shabby, like guests have accidentally wandered into a junk shop. But that needn’t always be the case. Find an empty corner of your room – say the space between the side of your desk and the wall. Then, starting with the large coffee table books and gradually getting smaller, stack your books one atop another in size order, spines facing outward to create a stylish little tower. Even better: try making a few of these and colour co-ordinating the spines of each book, so your study gains four or five eye-catching monuments to your love of literature. James Lee is an avid bookworm, aspiring author and writer with Design55Online.